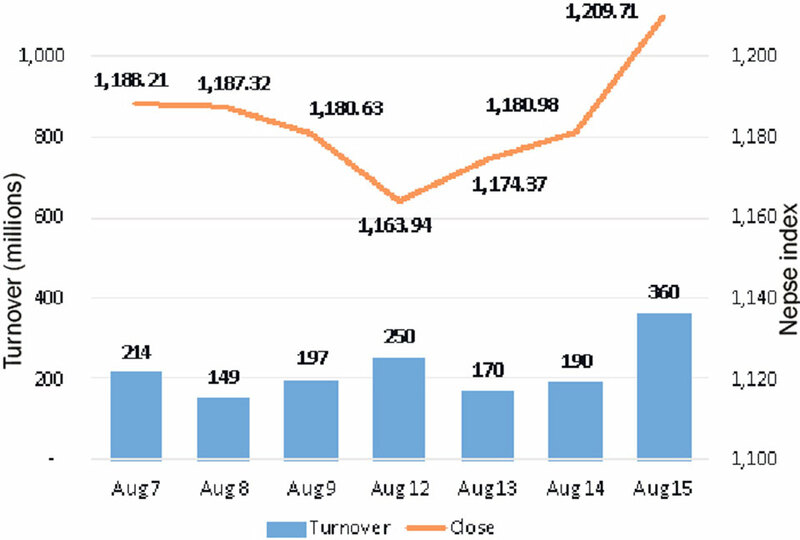 KATHMANDU, Aug 16: Stocks traded flat for most of the trading session on Monday. However, the benchmark Nepal Stock Exchange (Nepse) Index saw significant strength as the stocks rose in a broad rally in the final trading hour on Wednesday. The index that opened at 1,180.98 points surged 28.73 points to close at 1,209.71 points. The boost in the stock market came on the back of upbeat financial reports published by most of the bellwether banks on Wednesday. As a result, investors seemed sanguine and showed an increased enthusiasm to enter into transactions in the bourse. 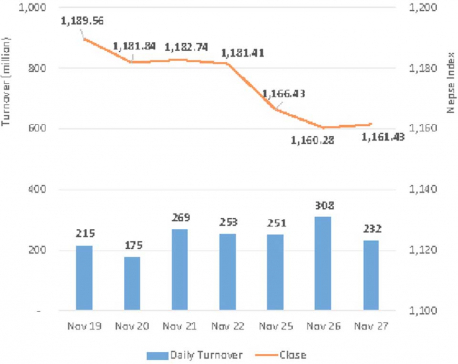 Total market turnover showed a significant improvement and increased to Rs. 364 million from the previous day's 189 million. On the sectoral front, all major sectors ended the day in green. Non-life insurers were the biggest winners as the segment's sub-index rose 3.56 percent. Development bank sub-index gained over 2.57 percent while hydropower sub-index added 2.47 percent. Similarly, banking stocks also showed a substantial move to the upside with its sub-index rising 2.46 percent. 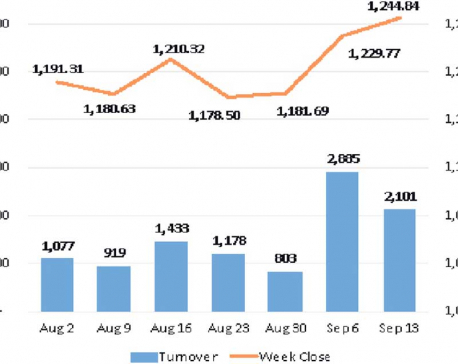 Market participation remained hugely in favor of commercial bank scrips. Nabil Bank Ltd led the list of actives with a total transaction of over Rs. 16 million. On Wednesday, the private sector lender published its fourth quarterly results reporting a net profit of over Rs. 4 million, the highest among its counterparts. 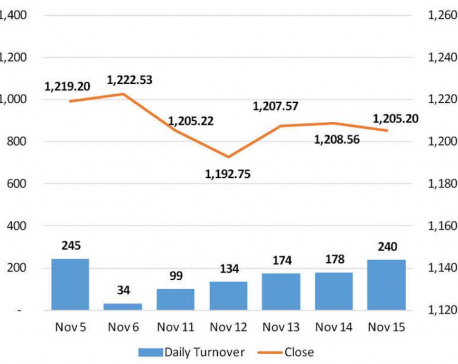 Similarly, Prime Commercial Bank Ltd Promoter Shares and Nabil Bank Ltd Promoter Shares posted turnovers of Rs. 16 million apiece. Among other active stocks, shares of Agriculture Development Bank Ltd and Global IME Bank Ltd registered total transactions of over Rs. 12 million each. In terms of advances, Swarojgar Laghubitta Bikas Bank Ltd posted a surge of almost 10 percent on the day. Next on the list, Himalayan Distillery Ltd and Taragaon Regency Hotel Ltd leapt over 7 percent each. Besides, Himalayan Power Partner Ltd and Summit Microfinance Development Bank Ltd closed over 6 percent higher. Conversely, Womi Microfinance Bittiya Sanstha Ltd was the biggest losing scrip locked in to the lower circuit of negative 10 percent. The micro sector lender announced 25 percent cash dividend to its shareholders on Monday. Further, Arambha Microfinance Bittiya Sanstha Ltd and Multipurpose Finance Company Ltd shed over 2 percent each. Other losing securities included shares of Khanikhola Hydropower Company Ltd and Laxmi Equity Fund. On the earnings space, Mega Bank Ltd reported a 48 percent increase in its net profit as per its unaudited fourth quarterly report. Among other banks publishing fourth quarterly results on the day, Standard Chartered Bank Ltd, Nepal Merchant Bank Ltd, and Sunrise Bank Ltd reported a decent year-on-year growth in their respective net profits. As per the ARKS technical analysis, the index formed a bullish marubozu candlestick on the daily timeframe reflecting the strength seen in the stock market. Subsequently, the index has breached the resistance level of 1,200 points. Technical indicators have also tilted in favor of bulls following three straight days of gain. If the index manages to stay above the 1,200 points mark in the coming sessions, a swing upwards to 1,250 points can be expected.